Curious to about our past workshops? Want to know what topics we’ve covered? Below you’ll find summaries of the different workshops we’ve facilitated. WEC Workshop and Lunch. The Writing Program and CAST are teaming up! During lunch, you’ll get walked through the requirements for making your course an official WEC Course. Afterwards, you’ll have time-on task (with assistance) to complete your WEC proposal. Scholarship/Writing Retreat. Join us for a day of productivity. Periods of quiet writing time will be bookended by goal/intention setting, productivity “tips”, some meditation or light yoga, and plenty of coffee. CPE Bootcamp. CAST is offering a two-day CPE bootcamp to assist faculty in the development of a CPE course that would be offered in 2019-2020. In two days (9am-3:30pm) you will learn about CPE expectations, nail down the big picture/big questions of your course, identify learning outcomes, and design group and individual assignments to help students achieve those outcomes. By the end of the two days, a draft course description will also be complete. 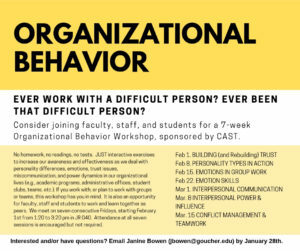 Participants will be expected to meet again once as a group during the spring semester (will be scheduled around participants’ schedules). The two days include coffee and lunch, and participants will receive a $500 stipend. Basics of Editing Video with iMovie: How to Make “How-To” Videos. 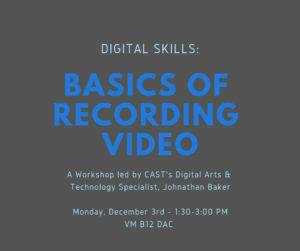 CAST’s Digital Arts Specialist Johnathan Baker will be offering an afternoon workshop open to faculty, students and staff on how to use iMovie. Faculty will get some additional ideas for how to leverage this skill into a video assignment for students. Augmented Reality Basics with Unity and Your iPhone. 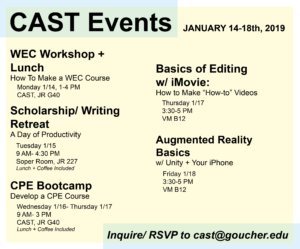 CAST’s Digital Arts Specialist Johnathan Baker will be offering an afternoon workshop open to faculty, students and staff to build very basic digital skills in augmented reality. For those unfamiliar with this term, augmented reality is where the real world is supplemented with some kind of virtual information for practical or entertainment purposes (imagine looking at a winter scene outside, then looking at the same scene through your phone’s camera and seeing dancing elves in that same view! Or imagine looking at a busy city street through your phone’s camera and seeing Yelp ratings of all the restaurants pop up as you move your camera from establishment to establishment). Winifred Cohn Borden ‘66 sponsored workshop: Supporting International Students and Second Language Learners, presentation by Lana Oweidat, Assistant Professor of Rhetoric and Composition and Director of the Writing Center, and Karen Sykes, Associate Director for International Students in the Center for Race, Equity and Identity (CREI). In this session, we will identify common misconceptions about teaching ELL students while working to better understand different language structures. 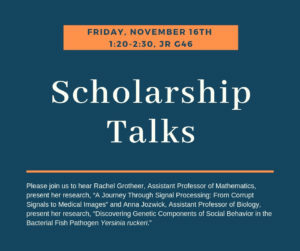 In addition to providing some data about the international students’ demographics at Goucher, we will introduce some of the academic and emotional concerns of this student population. We will present best practices in responding to their writing and accommodating to them academically while considering how to implement strategies that identify global patterns (big picture) in learning. Attendees can expect to leave with a better understanding of strategies aimed at teaching ELL students. Open Educational Resources: A High-Impact Practice Fostering Student Success, presented by C. Edward Watson, Ph.D., Associate Vice President for Quality, Advocacy, and LEAP Initiatives with AAC&U. A new large-scale study at the University of Georgia (UGA) reveals that faculty adoption of Open Educational Resources (OER) has similar student success benefits to AAC&U’s high-impact practices. While OER have saved students approximately $3.3 million at UGA, they also enable all students to have access to course materials on day one of the class. This has resulted in leveling the “academic playing field” with improved end of course grades and a decrease in DFW rates. These improvements were more pronounced for those who have been historically underserved by higher education. Those attending this session will leave with a broad understanding of the surprising impact OERs have on student success metrics as well as practical strategies for finding, adopting, and utilizing these materials. Presentation sponsored by the Nancy Smith Lurie Marks ’48 fund. Introduction to Creative Coding, presentation by Andrew Bernstein from Goucher’s Graduate Program in Digital Arts. Creative coding is the practice of using computer programming for art and design. 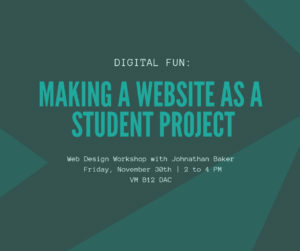 In this workshop, we’ll learn the fundamentals of computer programming from the perspective of the creative arts, focusing on animation, interaction, and generative art. 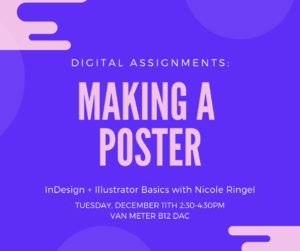 We’ll use the programming environment p5.js and explore how basic coding literacy can inform our work in the arts and beyond. Faculty Retreat, 2018 : In preparation for Spring 2018, CAST and the Office of the Provost put on a series of workshops to get faculty prepared for the upcoming semester, inform them of administrative changes and hosted guest speaker Jeanne Kincaid, expert on accommodations. January 2018 Workshops: Workshops and resources from January 2018. Summer CPE Institute 2017: During this institute, faculty met with CAST Director Robin Cresiski to discuss course building, share ideas and plan their own CPE classes slated for Spring 2018. May Workshops 2017:The May Workshops were facilitated by CAST director Robin Cresiski, other faculty and staff to present information on a wide range of topics, from making time for scholarship to teaching strategies.